These days securing access to cloud applications is critical, yet the current approach that relies solely on single passwords leaves business applications highly susceptible to compromise. A recent study by Internet security company BitDefender showed that 75 percent of social networking user name and password samples collected online were identical to those used for email accounts, indicating widespread reuse of passwords across multiple applications. Coupled with the number of recent large-scale thefts, including Electronic Arts and LastPass, user credentials -- and as a result, enterprise security -- are more vulnerable than ever. It's clear that relying simply on passwords to secure access to business critical applications is not sufficient. 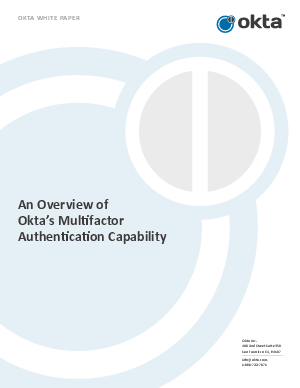 Read this whitepaper to find out more how to secure your cloud based applications using Okta's MFA solution.